Cut your coat according to your size! A Jobless man has generated mixed reactions on the media, after photos of him pushing his girlfriend around in a babysitter in Cape Town area of South Africa flooded social media. 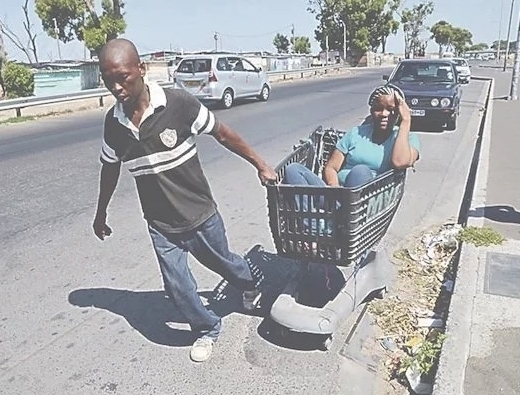 The 42-year-old man named Lizo Taliwe says he loves her too much, and so for that he won’t let her feet touch the ground, And since he doesn’t have a car, he will have to push her around, According to him its something that he enjoys alot. For her part, Zukiswa said she’s enjoying every bit of his attention and care, that she feels like a queen, adding that she chose to be with Lizo because he treats her like the queen she is. The couple, who have been together for eight years, said they fail to understand why couples abuse each other.